Welcome to CPR Kart Parts. You will be redirected to our online store in a moment. click this link to continue to our shop. Established in 2005, our online shop has been providing the best priced high quality go kart parts to thousands of happy customers over the last 6 years. We specialise in 4-stroke racing go karts but offer parts to build all sorts of projects and conversions using kart parts including Go Kart Torque Converters, reduction jackshafts, off road wheels and more! We offer ready-to-use bolt-on kits such as Kart Stub Axles / Spindles, Complete Rear Go Kart Axle kit, Go Kart Steering Assembly kits, Go Kart Tie Rods kits and heaps more. All complete with anodised countersunk washers, bolts & nuts! Try our new PROJECT kits which include brackets to attach our quality racing go kart parts to your own project, or update an older kart to our newer style fitments. We also have bare chassis and frames as well as all the parts to build your own racing go kart, easily safely and correctly! 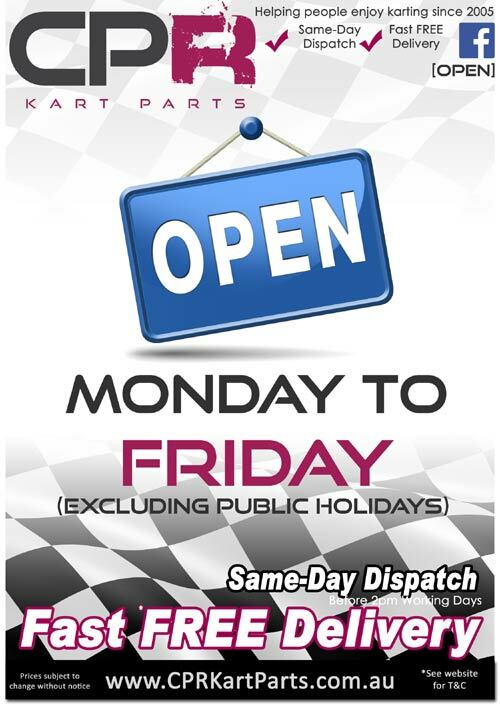 We also understand that there's only 2 days of fun in a week and that you want to make sure you get your parts quickly. That's why we ship our items out the same day as payment if paid by 2pm MONDAY - FRIDAY EST FAST and FREE to your door. "I would like to make a comment about your service. As I work in the Distribution Business dealing with hundreds of business a week, I believe you have set the bar that high that I do not think any other business would get even close to you, in the area of customer service. Your professional approach, advice, honesty and integrity are qualities rarely found these days. Keep it up as I believe that you and your business will go a long way." click this link to continue to our shop.